Check out our aluminum railing products, which are available in many colors, carefully selected to meet or exceed building codes. 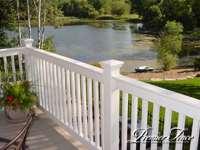 Aluminum railing to accent your backyard fence will not only enhance the value of your home, it will also provide you with a sense of calm knowing there is no maintenance required. 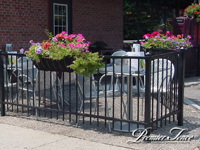 Our aluminum railing systems match our aluminum fence designs. All work featured performed by Premier Fence unless noted. Photos may show options and accessories not included in standard design. Mon. 8:00 a.m. - 4:00 p.m.
Tues. 8:00 a.m. - 4:00 p.m.
Wed. 8:00 a.m. - 4:00 p.m.
Thurs. 8:00 a.m. - 4:00 p.m.
Fri. 8:00 a.m. - 4:00 p.m.
©2019 Premier Fence Inc. All Rights Reserved.